Note: The following is a guest blog post by Lady Márquez and Juan Sebastian Torres from Ecology Project International (EPI), which received $25,000 in grants from IGTOA last year. 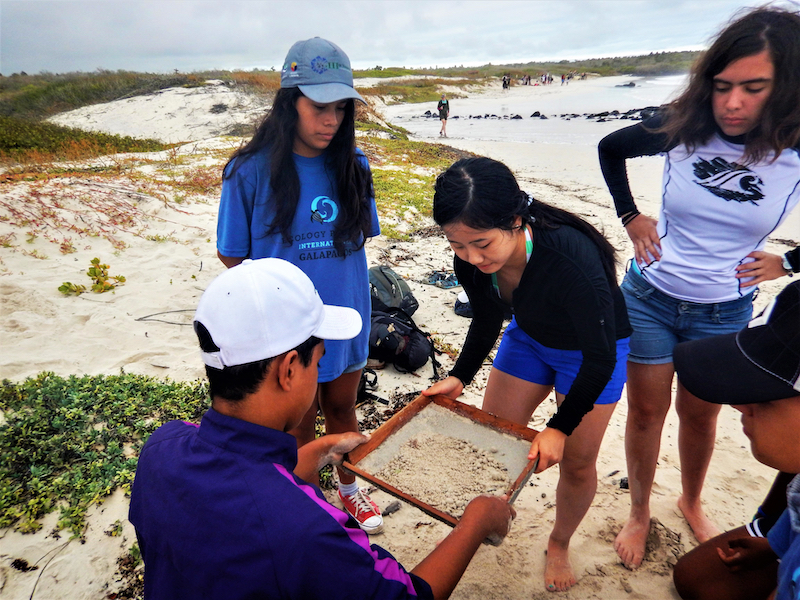 Thanks to IGTOA's support, our Galapagos wildlife ecology and alumni program prevented the loss of endemic biodiversity in the Galapagos through building local capacity for conservation leadership, and engaging teens in conservation research and experiential education. Our alumni program through its “Mola Mola” eco-club, in collaboration with the Galapagos National Park Service (GNPS), took action to create awareness among local and international visitors to protect green sea turtles' (Chelonia mydas) nesting beach, Tortuga Bay. Through this project, local youth increased their knowledge of the current nesting status of the green sea turtle and were offered a unique educational experience in which they could monitor this emblematic species at this public site. In addition, a constant effort to clean up the beach was done simultaneously. In 2018, our project involved 85 participants—including community members, tourists and local youth—in sea turtle conservation efforts, raising awareness in the community, protecting 16 green sea turtle nests and collecting 3,564 plastic items, 83% of which were plastic nurdles and 17 items sized less than 2.5 cm in diameter. Furthermore, this year our program empowered two of our local alumni to take action towards green sea turtle conservation. Precisely, Ibrahí Rodríguez and Erick Ojeda have taken their conservation leadership to the next level. Wanting to inspire youth to take action and protect this incredible species that relies so heavily on Isabela Island beaches for nesting purposes, Ibrahí and Erick developed and fundraised for their own local initiative, including winning one of EPI's Leadership Awards. To begin their initiative, they surveyed the community to get a sense of the locals' depth of sea turtle conservation knowledge. Then, they planned and held EPI-like sea turtle ecology courses for young community members. Finally, on June 16, Ibrahí and Erick organized a festival in Puerto Villamil town (Isabela´s capital) to celebrate the International Day of Sea Turtles with the support of the Galapagos National Park and Intercultural Outreach Initiative (IOI), an international organization present on the island. The event included a fair, presentations, music and games to create awareness about the conservation efforts made to protect this flagship species. More than 50 community members from Isabela island attended, including visitors, teachers, students and local families. 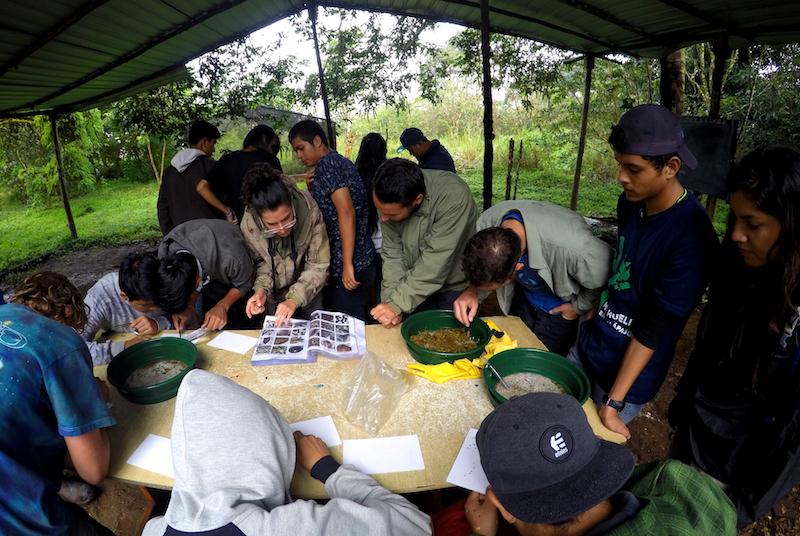 On the other hand, our Galapagos Wildlife Ecology Program successfully implemented seven ecology courses, involving 119 local participants from different islands. This year our participants were able to collect biometric data from 43 giant tortoises on Santa Cruz Island. Their conservation efforts made it possible to protect two different giant tortoise species, Chelonoidis donfaustoi and C. porteri, and to collaborate with the Galapagos National Park to help protect this flagship species. Another activity done by local students is the identification and count of plant seeds found in tortoise dung as part of research that Dr. Stephen Blake does with his team in order to better understand the current ecological impact of tortoise seed dispersal on Santa Cruz Island. A total of 9,321 seeds were identified by our students. Finally, our students had the opportunity to be inspired and get a deeper knowledge in local conservation challenges, such as “personal consumerism habits” and the “impact of invasive species,” thanks to an update in our curriculum done to deal with these important local issues with the students. Sebastian was born and raised in Quito, Ecuador. It was there he began to build a career focused on environmental conservation. Sebastian studied ecology and tourism in school, focusing on species identification and taxonomy. Following school, Sebastian worked as a naturalist guide in the Kapawi Reserve near the Amazon Basin. He also worked for a nonprofit organization, Biciacción in Quito, promoting the use of bicycles as a means of transportation. Sebastian came to the Galápagos to work as a field instructor for EPI. He enjoys working with students on the giant tortoise project and sharing the importance of conservation. During his free time, you can find Sebastian riding his bike and exploring nature. Lady was born in Guayaquil and raised in the Galapagos. Both of her parents worked at the Charles Darwin Research Station. Thanks to her peers, she got inspired to study biology at Ecuador Catholic University (PUCE) and deepen her knowledge in conservation in the binational Master in Nature Conservation program at Georg-August-Universitat Gottingen in Germany. Lady got the opportunity to join the green sea turtle nesting monitoring program, offered by the Charles Darwin Foundation and Galapagos National Park. She then worked at Ecology Project International (EPI) as an outreach and alumni coordinator. The experience with EPI allowed her to inspire local youth to take an active role in Galapagos conservation efforts and to understand why it is important to preserve the Galapagos ecosystem for future generations.